Synopsis: Brazilian Director Fernando Meirelles, whose previous film City of God won awards all over the world and was nominated for Best Foreign Language Film at the 2004 Oscars, has crafted another highly entertaining yet important film. 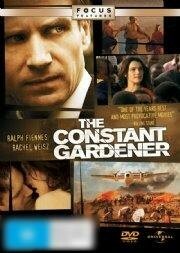 Beautifully shot in Kenya, Germany, Sudan, Manitoba, and London, The Constant Gardener, based on a bestselling novel by John Le Carr, is an exciting mix of romance and spy thriller. Meirelles's pacing is outstanding, switching effortlessly between political intrigue, action adventure, and love story, and Fiennes and Weisz give strong performances playing complex characters that will continually surprise the audience.